The absence of arch in the feet causing the soles to touch the ground is called a flat feet. An old term for flat feet is fallen arches. Having flat feet does not always cause pain or lead to other foot disorders. Flat feet can be rigid and inflexible and cause imbalance and problems in the ankles, legs, back, and bones and muscles as well. For some flat foot can be painful and might result in imbalance. Shoes that do not fit or fail to support and protect the arch can lead to painful imbalances between the bones, muscles and ligaments of the foot. Daily yoga practice can help strengthen the arches, foot and legs. Vira means a hero, warrior, champion. This sitting posture is done by keeping the knees together, spreading the feet and resting them by the side of the hips. The pose is good for meditation and pranayama. Kneel on the floor. Keep the knees together and spread the feet about 18 inches apart. Rest the buttocks on the floor, but not the body on the feet. The feet are kept by the side of the thighs, the inner side of each calf touching the outer side of its respective thigh. Keep the toes pointing back and touching the floor. Keep the wrists on the knees, palms facing up, and join the tips of the thumbs and forefingers. Keep the other fingers extended. Stretch the back erect. Stay in this position as long as you can, with deep breathing. Then rest the palms on the knees for a while. Then rest the palms on the knees for a while. Now interlock the fingers and stretch the arm straight over the head, palms up. Stay in this position for a minute with deep breathing. Exhale, release the finger lock, place the palms on the soles, bend forward and rest the chin on the knees. 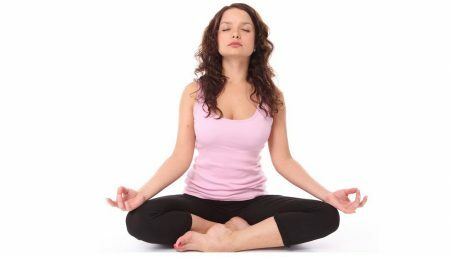 Stay in this position for a minute with normal breathing. Inhale, raise the trunk up, bring the feet forward and relax. A deep squat, Utkatasana immediately engages the strength of your legs, back, and ankles. From a standing position, step your feet hip-width apart so you feel grounded and connected to the width of your pelvis. On an exhalation, squat down from here as if to sit in a chair, keeping your heels on the floor. Explore the range of motion in your pelvis by bringing your hands to your hips, tilting your tailbone up (into a swayback) and then tucking it under. Notice the effect of both extremes. When you lift the tailbone, tipping the top of the pelvis forward, you jam your lower back. When the tailbone is tucked under, your abdomen is restricted. Now find the balance. Reach back and feel your sitting bones (those bony points at the base of your buttocks). Take your hands and sweep your sitting bones back as if dusting off your bottom葉his is the direction you want to move your sit bones. Keep releasing your sitting bones back while turning your tailbone down, so the sacrum moves forward into the body. You should feel a release in the lower back as your pelvis is stabilized (neither tucked nor swaybacked) and your sacrum broadens. On an inhalation, come up to standing and take a few cycles of breath to rest your thighs and integrate what you have experienced. Practice Tadasana with lifted toes lifted on the floor. Another asana would be Frog pose (Bhekasana) although this pose is done lying down on the stomach. Standing poses, one-legged poses, stretches and poses that elongate the leg, foot and body add strength and pull out muscles into a smooth position.